Vero Beach Publix says subject walked out with 20 bottles of wine and other items. 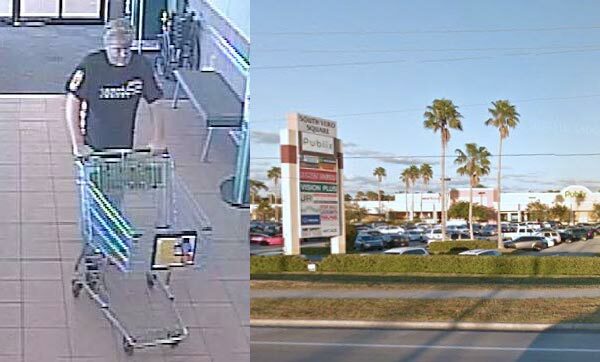 VERO BEACH – The Indian River County Sheriff’s Office is attempting to identify a subject who stole 20 bottles of wine, four bowls of precut watermelon, and other items from the Publix at 810 S. U.S. Highway 1 in Vero Beach. The store manager at the Vero Beach Publix told deputies that he watched a man wearing a black shirt and blue jeans walking around Publix with about 20 bottles of wine and the watermelon in a grocery cart. The manager then watched the subject walk out of Publix and placed the items in the trunk of a Kia Soul box-shaped vehicle. As the manager walked towards the subject, he started to drive away. He was I walked towards him, he started driving away. He took down the license plate, but it comes back to a different vehicle in Tampa. Reviewing store surveillance, deputies observed the man selecting an empty shopping cart and filling it with 20 bottles of wine, watermelon, and other assorted items. He walked through the produce section and then though the front of the Vero Beach store. The man passed all points of sale, failing to pay for any items in his shopping cart. The Indian River County Sheriff’s Office needs your help on identifying the subject. If you know his identity, please contact Deputy Matt Redstone at (772) 978-6161 and reference case number 2017-94137. You can remain anonymous and possibly be eligible for a reward of up to $3,000.00 by contacting Treasure Coast Crime Stoppers at 1-800-273-TIPS (8477) or www.tcwatch.org.